To reduce your cost, Brandsport offers this item in Bulk (sold here individually). Gorilla also lists this same item in 4-piece sets as Display Package # 41137 and Bag # 41137B. 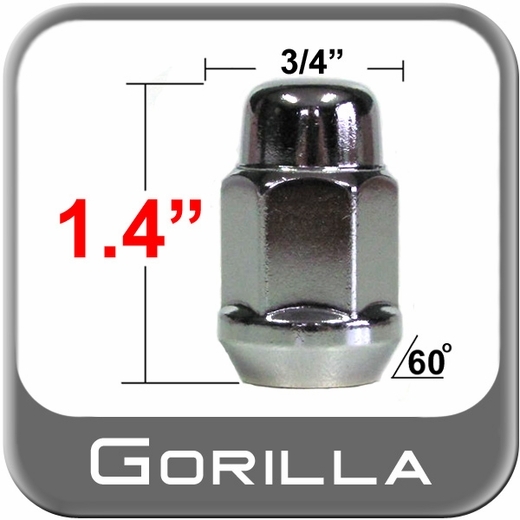 Fear no rust and corrosion with an unmatched chrome finish guaranteed to extend the lifespan of any vehicle. .
Each 12mm chrome lug nut is cast from hardened steel of irreproachable quality. Custom engineered by Gorilla with absolute precision, extended accuracy and fit in mind . threads on and off as expected. I haven't had long enough to see how well the chrome will hold out.